CHICAGO — Two African-American women are headed for a runoff in the Chicago mayor’s race, setting up an election that will make history. Lori Lightfoot, a former federal prosecutor and sharp critic of the status quo at City Hall, and Toni Preckwinkle, the county board president and chairwoman of the county’s Democratic Party, will face one another in a runoff election set for April, according to The Associated Press. The third top vote-getter — William M. Daley, a member of Chicago’s political dynasty of Daleys — earlier conceded defeat. Either Ms. Lightfoot or Ms. Preckwinkle would be the first African-American woman to lead the nation’s third largest city, succeeding Mayor Rahm Emanuel as mayor. Only one other woman, Jane Byrne, has been elected mayor, in 1979. If Ms. Lightfoot were to win, she also would be the first openly gay mayor of Chicago. 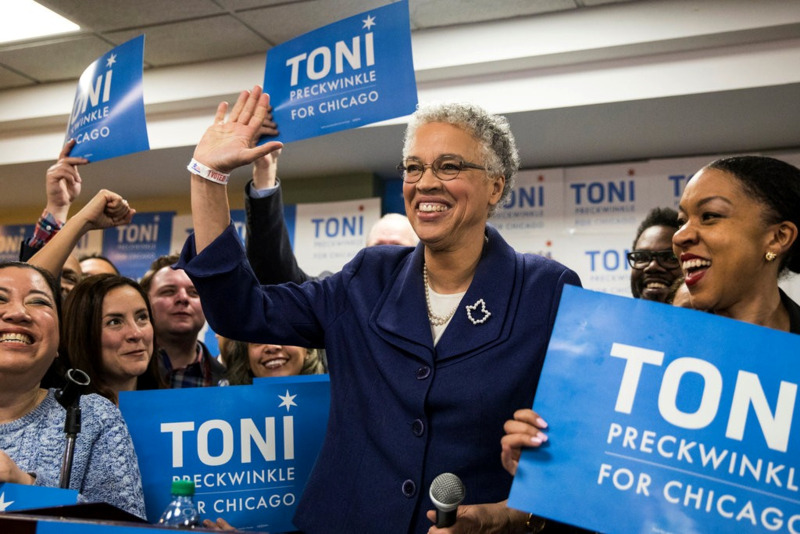 Ms. Preckwinkle, 71, a long established politician who has often been urged to run for mayor, had been widely expected to do well in Tuesday’s balloting amid a cast of 14 candidates. The success of Ms. Lightfoot, 56, who has never held elective office before, was far more surprising; she was less well known in Chicago’s political sphere and had far less money. Her win, too, was seen as something of a rebuke to Mr. Emanuel’s tenure as mayor and to Chicago’s old political history. Ms. Lightfoot had tried to define her campaign as a rejection of machine politics and a refocusing on Chicago’s struggling neighborhoods, not just its gleaming downtown. The historic nature of the runoff was not lost on Ms. Preckwinkle’s supporters, who gathered at a party on another side of town. The crowd cheered when Bridget Gainer, a county commissioner, noted from the stage that Chicago city would, one way or another, have an African-American woman as mayor later this year. Lonnell Saffold, the recording secretary for a local unit of the Service Employees International Union, said having two black women in the runoff shattered “a glass ceiling that Chicago probably would have never fathomed.” Mr. Saffold said he voted for Ms. Preckwinkle, but that Ms. Lightfoot had been his second choice. The city’s votes were sprinkled widely across the massive field of 14 candidates who had hoped to replace Mr. Emanuel, who didn’t run for a third term. With 92 percent of the votes counted, Ms. Lightfoot had the highest vote tally, with about 17 percent. Ms. Preckwinkle had 16 percent, and Mr. Daley, who was well funded and who many here had expected to easily make the runoff, came in just below 15 percent. For months, Chicago’s campaign has looked like a reunion of its best-known political figures — a former police superintendent, a former public schools chief, a former city clerk. 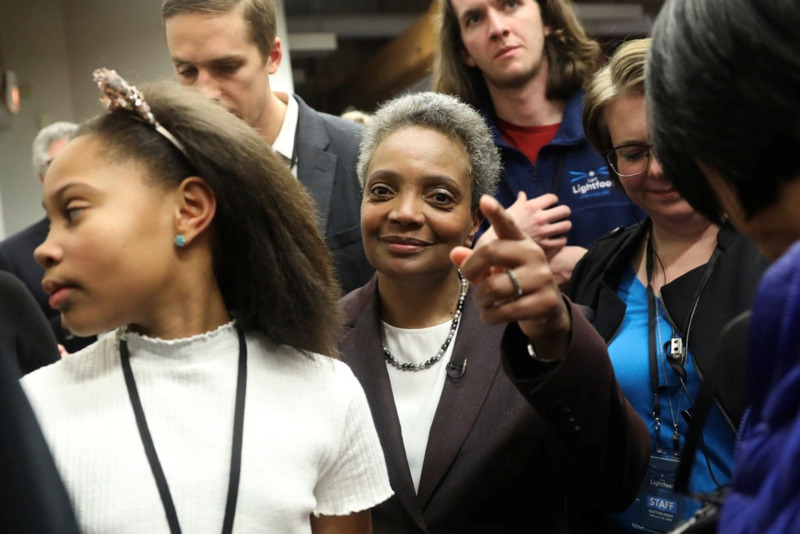 Among the names most familiar to voters were Ms. Preckwinkle and Mr. Daley, a brother of this city’s longest-serving mayor (Richard M.) and a son of the second-longest-serving mayor (Richard J.). Richard M. Daley, who ran Chicago for 22 years before Mr. Emanuel arrived in 2011, was sometimes known as “Mayor for Life,” and some Chicagoans thought the Daley name alone would at least advance the latest Daley into a runoff. On Tuesday night, Dona Scott, whose husband, Sam, was Mr. Daley’s campaign chairman, lingered after Mr. Daley conceded defeat from a stage. Sam Scott, the campaign chairman, said that he felt Mr. Daley was hurt by negative ads in the last two weeks from his competitors. For weeks, the sheer number of candidates seemed to have left some Chicagoans flummoxed — unsure, even in the final hours, whom they would vote for. Some political strategists said they wondered if that might discourage some people from voting at all in the election, which is technically nonpartisan, though Democrats reliably win. Mr. Emanuel upended Chicago’s political landscape when he announced in September that he would not seek a third term. Mr. Emanuel — who had been sharply criticized over his handling of school closings, crime and police misconduct and had faced political challengers — said at the time that the mayor’s office “has been the job of a lifetime, but it is not a job for a lifetime.” After that, many more candidates stepped forward. Whoever becomes the next mayor of this city of 2.7 million people will face an array of complicated, sometimes interconnected, challenges all at once. The city’s pension system will require an additional $1 billion in revenue by the end of the new mayor’s first term. Yet residents say they are weary from years of increases in their property tax bills and fees. Crime and gang violence remains a deep worry for many, even as the city contends with its long history of troubled relations between the police force and residents, especially in the black community. And although tourism has boomed downtown, development along the Chicago River has flourished and corporations have flocked to the city in recent years, some neighborhoods on the South and West Sides have struggled with disinvestment, schools closing and people moving away. On Tuesday, Jackie Ropski, a marketing director for an elementary school, said that she saw this election as more important than some, with so many candidates to choose from and at a pivotal moment in Chicago history. Alex Ruiz, 33, a student and Uber driver, said that the biggest issue that worried him was Chicago’s financial situation and its looming pension obligations. The next mayor, he said, had to get the city’s finances in order to spread confidence to Chicagoans about the state of the city. Mr. Ruiz grew up only a few miles east of his current neighborhood, Irving Park, but his family had steadily moved west throughout his life as gentrification kept pushing them out. At Manny’s deli, south of downtown, Natalie Wasso said she was leaning toward voting for Mr. Daley, if she voted at all. Ms. Wasso, 32, a phlebotomist who lives on the Southwest Side, said she trusted the Daley family, which led the city for most of her childhood. Her grandmother had always voted for Daleys in past elections. But Jewel Morris, 62, a retired probation officer, said he had voted for Ms. Preckwinkle, though he deemed her the “lesser of two evils” compared with Mr. Daley. The Chicago of 2019 is better than when he was a child, he said. The architecture is unparalleled, the restaurants are world-class and tourists are coming to the city in droves. But the inequality feels like the Chicago of his youth.